A lot of people find listening to music helpful, as it not only helps improve their mood, help them relax but also make them feel happier. Today, technology has made it easier to listen to music through mp3 players, smartphones and via the internet. 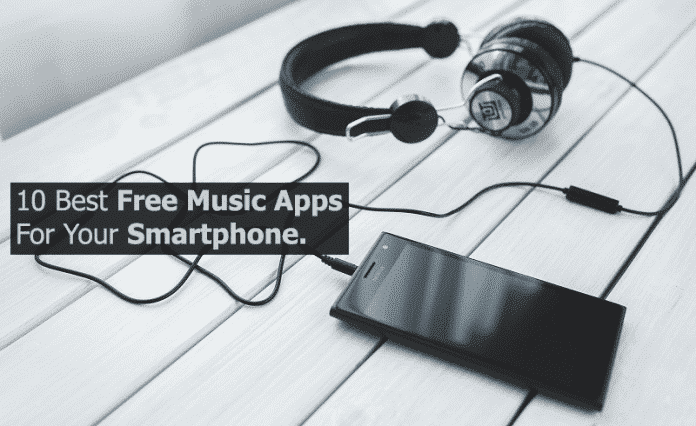 For all those music lovers who want to wiggle and jiggle and dance to the tune of their favorite song on the go, we bring the top 10 popular music apps that are completely free and most are compatible with both Androids and iPhones. Spotify is an awesome free music app that boasts a generous library, curated stations and playlists. It allows you to create your own stations and playlists, and also recommends music based on your initial interest. You can play any artist, album, or playlist in shuffle mode, as well as sync music from your desktop. It allows you to browse for new music by tracks, charts, new released, podcasts, and several videos as well as listen to recommendations stations. Spotify for your mobile also comes with a customized library, where you can view the recently heard playlists as well as your favorite songs, albums, artists, podcasts, and more. Pandora is a free music app is not only easy to use but also has an incredible library of music. It lets you stream songs that you wish to listen. You can create stations based on your favorite songs, artists or genres, or browse through genre-based stations, or launch a shuffled playlist based on your listening history. You can also stream an unlimited amount of ad-supported music every month. It allows you to rate the songs and bookmark favorite artists that you come across while you listen. You can help improve the app’s recommendations by giving the songs you like a thumbs up on the navigation bar. It is recommended to use the Pandora app when you’re connected to Wi-Fi, as this will allow you to stream the songs with little to no buffering. Compatible With: Android, BlackBerry, iPad, iPhone, iPod touch, Kindle Fire, NOOK, and Windows Phone. It also can be used with Apple Watch and Pebble. iHeartRadio is a free broadcast and internet radio platform that supports tons of devices, and has awesome features, zero commercials, and thousands of podcasts. It is the only service that allows listeners to save and replay songs right from live broadcast radio to their digital playlists. It also includes AM and FM radio stations that support data streaming and you can even listen to news, sports, talk and comedy shows. You can create your own personalized music stations by searching for a song or artist. It also allows you to view lyrics as you listen, see an artist’s biography, and share a station with others. Besides mobile apps and desktop web browsers, iHeartRadio is available for Windows 8, Xbox, Amazon Fire TV, Roku, Yahoo! TV and more. Compatible With: Android, BlackBerry, iPad, iPhone, iPod touch, Kindle Fire, Windows Phone 8/7. It is also available on Xbox, Amazon Fire TV, Roku, Yahoo! TV and more. Shazam is one of the world’s most popular free music app that instantly identifies the song that’s being played and then tells you the name of the song and the artist. It does even need Wi-Fi connection to do this. You can also see what people around the world are listening to in the ‘Explore’ tab. Further, based on the music it has recognized, Shazam can automatically add songs to a Spotify playlist, as well as create a Pandora station. It also saves history of your songs that you Shazam on record so that you can find them anytime. Compatible With: Android, BlackBerry, iPad, iPhone, iPod touch, Nokia, Windows 8 tablet, and Windows Phone. There’s also a free download for Mac and Windows computers. Slacker Radio is a free music app that traditional genre, specialty, and artist stations pre-programmed by professional DJs while also allowing users build entire stations of specific artists. You can continue to develop any of these stations by rating favorite songs and banning artists or songs. Stations can also be adjusted to play older or newer music, more hits or more eclectic music. While listening to these stations, you can fine tune them to play more of the songs that you like. You can also create new stations and playlists, keep record of your favorite songs and recently played songs. Compatible With: Android, BlackBerry, iPad, iPhone, iPod touch, Nokia, Palm, and Windows Phone. Google Play Music app is a pre-installed and best ad free app to download free music on your smartphone. It has very simple, elegant and classic user interface and you can easily find any music track from this app. You can upload up to 50,000 of your own songs to your Google account (each song can be up to 300 MB) and then instantly have access to all of it with an easy to use app. It has some exciting features like smart recommendation, which will suggest you songs according to your taste by matching genres of songs that you generally listen. Your music can be stored in the cloud so you can listen to them anytime and anywhere. You can also share them with your friends in Google+ and save your favorite songs for offline playback. Compatible With: Android, iPad, iPhone, and iPod touch. Google Play Music also works in a browser in any of the aforementioned devices. SoundCloud is one of the popular free music streaming apps for your smartphone, that allows you to download your favorite music tracks using their ‘Save as Offline’ feature. It also lets you to discover and search for music files, hear new music by audio creators, and record your own. You can also find your favorite music from Genres section or by searching by any query from search bar. SoundCloud allows you to listen to music and share them with others. For those, who want to start their music careers online, and for those who want to listen to new music, this is a great app. Though, free version of this app has some ads but you can pay a small fee to get ad free user experience. Compatible With: Android, BlackBerry, iPad, iPhone, and iPod touch. Launched by Amazon.com, Amazon Music app is a music streaming platform and online music store that is really easy to use. It allows you to upload up to 250 of your own songs to your Amazon account, organize your music in playlists, add the existing playlists present on your device, play the local songs present on your device, supports adding music to your account from a PC or Mac, access songs that you purchased on the site, a bunch of free songs, and your entire Cloud Player library. It also lets you to download your music online so that you can listen to it from the app even without an internet connection. If you are already an Amazon Prime member, you enjoy an ad-free experience and unlimited access to millions of songs. Compatible With: Android, iPad, iPhone, iPod touch, and Kindle Fire. It also works on Samsung TV, Roku, Sonos, and the web. TuneIn Radio is a radio aggregator, and lists lots of radio stations from across the world. It allows you to find and listen to local radio stations, world’s sports, news, talk, and music from wherever you are. It has over 100,000 radio stations and more than four million on-demand programs streaming from every continent, and is available across 200+ connected devices. It also includes AM and FM radio stations that can be streamed over data. Once you enter a song or artist, it instantly displays a list of all the radio stations around the country that play that song or artist. You can then listen to that radio station from your phone with just a push of a button. TuneIn Radio also has a paid version, which allows subscribers to record anything played through the TuneIn service. Compatible With: Amazon Kindle, Android, Bada, BlackBerry, iPad, iPhone, iPod touch, and Windows Phone. It also works for several smart TVs. 8tracks is another free radio app for mobile devices that allows you to listen to ad-free user-curated playlists consisting of at least 8 tracks. You can search through existing mixes and/or as create your personal mixes. You must include a minimum of eight songs, uploaded from your personal music library or directly accessed from the 8tracks library, per playlist. You can search for mixes by individual artist, activity, specific genre, or by utilizing the “cloud” feature that sorts mixes by mood (i.e. autumn, love, sad, eclectic). You can also share mixes, comment on them with other users, and like the mixes for recommendations of similar music. You can view your favorite collected tracks later on SoundCloud or YouTube. Compatible With: Android, BlackBerry, iPad, iPhone, iPod touch, Palm, and Windows Phone. It can also be used be used in Windows 8, Xbox, WordPress and Joomla via a plugin, any mobile browser and several other places.